Markings: The left side of the barrel is marked “DETECTIVE SPEC. / .38 SPECIAL CTG.”. The left sideplate is marked with the “Rampant Colt” logo. The crane and crane flat are both marked “7083RD”. The right side of the barrel is marked “COLT’S PT. F.A. MFG. CO. / HARTFORD, CONN. U.S.A.”. The left front of the trigger guard is marked with a “VP” in a triangle and the rear with “G”. Barrel Length: The barrel is 2” in length and has a full-length ejector shroud. Sights / Optics: The revolver is mounted with a square groove in the top strap for a rear sight. The front sight is a smooth ramp the full length of the barrel. Stock Configuration & Condition: The grips are Pachmayr Presentation/Compac black checkered rubber that enclose the entire grip frame. There are silver colored Rampant Colt medallions on each side, and there is a finger groove for the little finger molded into the bottom front corner of the grip. The checkering is sharp and we didn’t see any handling marks in the grips. The grips rate in about Excellent overall condition. Type of Finish: The barrel and frame are blued. The top and rear face of the hammer have a matte black finish while its sides are “In the White”. Bore Condition: The bore is bright with sharp rifling. There is no erosion in the bore. Overall Condition: This revolver retains about 99+% of its metal finish. There are a few tiny marks in the sides of the frame and an extremely light partial drag line in the cylinder that never breaks the finish. The ejector rod knurling and the hammer serrations are sharp. The screw heads are sharp and the markings are clear. Overall, this revolver rates in about Near Mint condition. Mechanics: The cylinder lockup on this revolver is SOLID on all six chambers and the single action trigger is crisp. The action functions correctly. We did not fire this revolver. As with all used firearms, a thorough cleaning may be necessary to meet your maintenance standards. Box, Paperwork & Accessories: This pistol comes with its factory paperwork and its factory box. The box is blue plastic with a textured finish on the outside, and the inside fitted for this revolver plus accessories, with storage in the inside of the lid for the Owner’s Manual. The outside of the lid is molded with “COLT” in a circle. The box shows no marks and is in Excellent condition. The box is covered with an outer brown cardboard box covered with pictures of old Colt advertisements. One end panel of the outer box is marked with the make, model, caliber and serial number of this revolver. The outer box is torn at one corner and frayed on two corners. It is in about Fine Plus condition. The paperwork consists of an Owner’s manual, a caution tag attached to the trigger guard, a Colt warranty card, a list of authorized repair stations, a “Colt Companion” brochure and a letter from Colt congratulating the new owner on their purchase. Our Assessment: The Colt Detective Special was basically the same revolver as the Police Positive Special, except it was limited to a 2” barrel with a few made in 3”. The Colt Detective Special and its aluminum framed cousin, the Colt Cobra, were very popular with police detectives because they held 6 cartridges vs. the 5 cartridges of the S&W Model 36. The Detective Special had a long production run, from 1927 to 1995, testifying to the popularity of this model. This is a 4th Issue Detective Special made in 1975 and chambered in .38 Special with a 2” barrel. The revolver is in about Near Mint condition with bright, sharp rifling and a Solid cylinder lockup. This revolver can be used for home protection and informal target shooting, but it is really great for concealed carry. With a revolver there is no safety to worry about and nothing to jam – just point and shoot – offering superb reliability when your life is on the line. 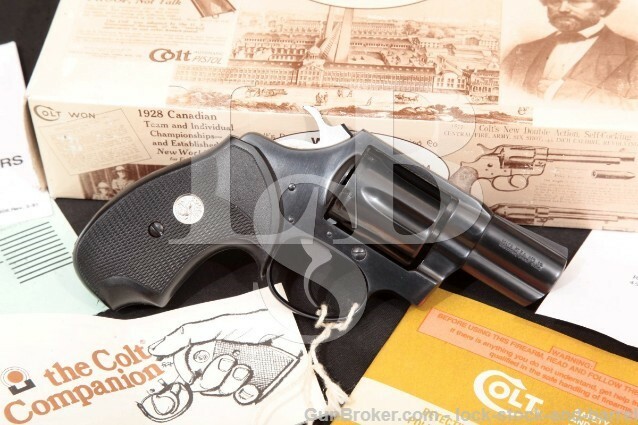 However, the Detective Specials aren’t made anymore, and like many of the Colt revolvers, have become collector items. With the nice finish on this revolver, and with its factory box and paperwork, we think the collectors will outbid the shooters on this one. CA Legal or CA Private Party Transferable: This revolver CANNOT be transferred in California but CAN be sold to a California resident as a private party transaction (PPT) at our shop in Simi Valley. This does not apply to out of state buyers.